Dolly Ki Doli starring Sonam Kapoor will release next year. Makers of the upcoming movie ‘Dolly Ki Doli’ have announced the film’s release date. Actor turned producer Arbaaz Khan posted on his Twitter account that the movie is all set to be released on February 6, 2015. 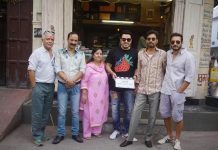 The upcoming movie is a comedy drama flick which will be directed by Abhishek Dogra. The story of the movie revolves around a girl who loots men after marrying them and runs away. The movie also stars Rajkummar Rao and Pulkit Samrat. The movie is a woman centric flick and this will be the first time Sonam will be seen opposite Rajkummar Rao and Pulkit Samrat. The shooting of the movie begun on the auspicious occasion of Gudi Padawa. Sonam will take on the roll of a runaway bride, but the only difference is that instead of commitment issues, the bride runs away with the money of the groom. Once again Malaika Arora Khan will be seen in an item song with Rajkummar Rao. The item song has been composed by Sajid-Wajid and will be choreographed by Remo D’souza. Singer Mamta Sharma of the ‘Munni Badnaam Hui’ fame has sung the song. The makers had earlier planned to release the movie, by the end of 2014, but then their plans were postponed to February 6, 2015.